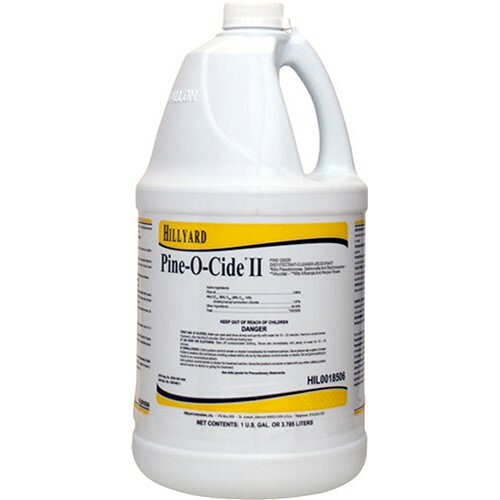 Hillyard Pine O Cide II is a proven disinfectant- detergent that cleans, disinfects, and deodorizes hard surfaces in schools, hospitals, extended care facilities, public buildings, industrial plants, and a multitude of other facilities. Effective against a broad spectrum of both gram positive and gram negative bacteria. As it cleans, it freshens the air by killing odor causing bacteria. Its aromatic pine fragrance leaves your rooms smelling pleasant and clean. Pine-0-Cide II can be used to disinfect and clean a variety of surfaces including walls, floors, tables, counters, glass, metal, plastic, tile, porcelain, lavatories, stools, and urinals. Pine-0-Cide II is EPA registered. Dilution rate 3 oz per gallon. Proven effective against a broad spectrum of bacteria. Case Specs: Four one gallon bottles per case, sold as one gallon bottle.